For most people the word 'wedding' instantly conjures up images of flowing white dresses, veils, top hats, open-topped vintage cars and a tiered cake big enough to feed a thousand guests. That's what you're signing up to when you decide on a formal wedding - years of traditional etiquette and elegance that embody the spirit of what marriage is all about. From food to flowers to fancy speeches, here's a guide to observing the protocol. No self-respecting traditional bride would walk down the aisle in anything but a classic long white number, but there's an infinite number of twists on the standard floor-length dress. Use your height, figure, colouring and general clothing likes and dislikes to decide whether your outfit should be a romantic profusion of lace and ruffles, or a minimalist creation of smooth, uninterrupted lines. Top the dress off with a veil - and don't forget your old, borrowed and blue items for luck! Morning dress is the ultimate formalwear for grooms, consisting of a frock-coat worn with matching or contrasting trousers, a waistcoat, high-collared shirt and top hat. Colours from navy through to light grey (or even white for the brave) are a matter of personal taste, but avoid black if you don't want to be mistaken for an undertaker. A word of warning - morning dress is only acceptable if your wedding's before 3pm. Grooms dressing for evening ceremonies should opt for black tie (complete with studs, cummerbund and waistcoat), or white tie and tails for the ultra-formal. Bridesmaids need to ensure their dress styles are in keeping with the formality of the service, so bare shoulders and tight skirts aren't an option. Groomsmen should be ready to hire morning dress or dinner jackets, with different-coloured waistcoats, cravats or hatbands to distinguish their outfits from the groom's. 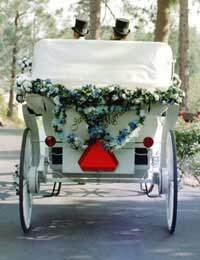 Nothing quite matches up to the Cinderella-style enchantment of arriving at your venue in a horse-drawn carriage decked out with flowers and ribbons. However, to arrive on time, you'll need to ensure you're within two miles of your wedding venue and that the route is easily traversible by horses. Traffic-choked city streets won't do the animals or your outfits any favours. If you're travelling a long distance or simply aren't an animal lover, opt for the timeless elegance of a vintage car instead. From classic Rolls-Royces to open-topped Bentleys, there's bound to be a vehicle that'll get you there in style. complete with ribbons on the bonnet. Make sure your hair and make-up are robust if you're travelling with the top down - dishevelled locks and smudged lipstick will wreck your look. Regardless of wording, the same structure will always be followed in a formal church ceremony. The priest opens the service with an introduction, followed by the 'giving away' of the bride. The vows come next, then the exchange of rings, and finally the official declaration of the couple's marriage and the signing of the register. Interspersed with these vital elements are hymns, music, readings, and the celebrant's sermon on what marriage entails. If you're not a regular church-goer, you may need some advice about which hymns or Biblical passages will be appropriate for your wedding day. Talk to your celebrant to see if they have any recommendations, and scour the web for information on popular classics. Don't worry about everyone having heard them several times before - the old favourites such as 1 Corinthians 13 usually get a better response than something less traditional. As your guests are also unlikely to be familiar with the precise order of your service, it's a good idea to produce a wedding programme that gives them a rundown of proceedings. Your programme can include the words of hymns, readings and poetry, as well as names, photos and descriptions of the bridal party, alongside the programme. There's something very indelicate about the suggestion of following up a full-on, formal white wedding with a finger buffet - you might as well pack the guests off to McDonalds to celebrate! Nothing less than a sit-down meal at decorated tables fits the occasion. However many courses you decide to have, dinner should be topped off by a traditional wedding cake, which should be tiered, iced in white or cream royal icing and lavishly decorated. Don't feel obliged to go for the conventional fruit cake when you're choosing a base - the look of the cake's the important thing, and most people will prefer chocolate or sponge to a stodgy fruit loaf at the end of the meal. Formal wedding receptions employ a toastmaster - a person to announce each speaker before they give their speeches. Sometimes the best man fulfils this function, but a separate person with experience of weddings is often hired to do the job.The traditional order for speeches sees the father of the bride opening proceedings by reminiscing about his daughter and offering a toast to the newlyweds. The groom then gets up to thank his new in-laws and the rest of the bridal party, finishing with the bridesmaids. Last - but by no means least - the best man makes the keynote speech, beginning by accepting the groom's thanks on behalf of the bridesmaids and offering thanks to all those who helped with wedding preparations - before descending into jokes and reminiscences about the groom! There is no place in the original etiquette for brides to make a speech, but as increasing numbers of women choose to do so, they should slot in between the groom and best man, using the opportunity to thank their new in-laws, the groomsmen and anybody who was unable to attend the wedding. There is a standard etiquette for numerous procedures associated with a formal wedding that involve the bride, groom, best man, chief bridesmaid and both sets of parents. These include the signing of the register, the seating plan for the top table, the order of the receiving line and who should ask whom to dance first. Many of these traditional systems are not appropriate for a formal wedding in today's society. For starters, divorce and remarriage means that the bride and groom often have step-parents to fit into their plans, and standard etiquette is too narrow to accommodate extra people. Increasing numbers of single people also make traditional male-female seating tricky to comply with. If you're finding it difficult to comply with tradition, relax your ideas. A formal wedding today is more about things that fit in with the romantic ideal than adhering to every single rule in the book. The bottom line is that it's your wedding and you should ensure that whatever system you follow suits you - not some outmoded notion of etiquette!